Saeed Jalili, Iran’s chief nuclear negotiator, will head to China Thursday amid reports that Beijing has agreed to join other permanent members of the UN Security Council to draw up new sanctions on Iran over its nuclear program. Jalili’s unexpected visit comes at the invitation of the Chinese, raising speculations that Beijing wants to pressure Iran to make last-minute compromises to avoid a new round of sanctions. ABC News reported today that the missing Iranian nuclear scientist Shahram Amiri has indeed defected to the United States and is working with the CIA. Mr. Amiri disappeared while he was on a hajj trip to Mecca. He is believed to be one of Iran’s top nuclear scientists working at newly disclosed Fardu uranium enrichment plant near Qum. Last October, the Iranian Foreign Minister Manouchehr Mottaki had accused the US of abducting Mr. Amiri and asked for his return. If the ABC report is verified, it would represent an intelligence coup for the US. Amiri’s disappearance “was part of a long-planned CIA operation to get him to defect,” ABC reported, citing an unnamed US intelligence official. 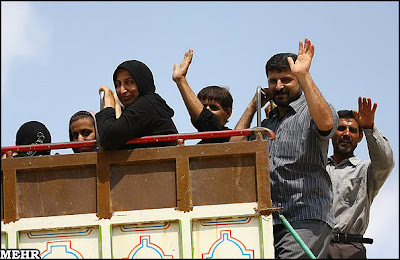 Iran’s intelligence agents have freed an Iranian diplomat who had been abducted in Pakistani town of Peshawar in November 2008. 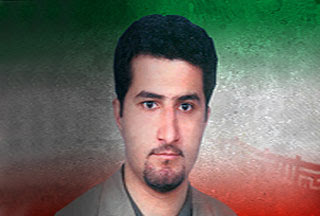 Heshmatollah Attarzadeh was going to work at the Iranian consulate in the city when abducted. The Iranian authorities did not give any details on the operation resulting in Mr. Attarzadeh’s freedom, even though they hinted that it was a cross-border operation. The news comes weeks after the Iranian agents captured Iran’s most-wanted leader of a Sunni militant group during a daring operation. 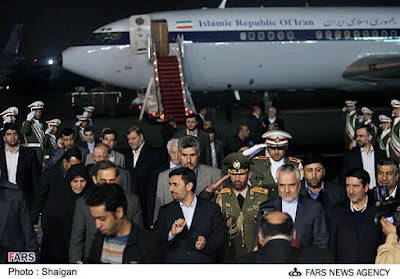 Then the Iranian Air Force jets forced a flight from Dubai to Bishkek, Kyrgyzstan, to land in Iran and the agents reportedly picked up then-Jundallah leader Abdolmalek Rigi from the plane. - Gurbanguly Myalikguliyevich Berdymuhammedov, President of the Republic of Turkmenistan. - Jalal Talabani, President of the Republic of Iraq. - Grand Ayatollah Sayyid Ali Khamenei, Supreme Leader of the Islamic Republic of Iran. - Mahmoud Ahmadinejad, President of the Islamic Republic of Iran. - Imomali Sharipovich Rakhmonov, President of the Republic of Tajikistan. - Hamid Karzai, President of the Islamic Republic of Afghanistan. The UN General Assembly recognized March 21st as the International Day of Norouz earlier in February, calling on world countries to draw on the holiday's rich history to promote peace and goodwill. Brazilian President Luiz Inacio Lula da Silva has stated he is going to Iran on the 15th of May this year to make some statements since he doesn't: "want the mistake that was made in Iraq to be repeated in Iran." He stated that the Iraq War happened because of a lie spread by the western powers that invaded in 2003 on the pretext of removing Saddam from power and stopping him from using 'Weapons of Mass Destruction', such weapons the US Army occupying the country to this day haven't found. "I'm going there to tell President Ahmadinejad, in Tehran: 'I am against you building nuclear weapons, but I am in favor of you enriching uranium like Brazil does, to produce nuclear energy,'"
To date the International Atomic Energy Agency's (IAEA) inspectors stationed in Iran have not been able to find evidence to support Western claims of diversion in the Iranian nuclear program, the US in particular allege that Iran intends to develop nuclear weapons under the disguise of a civilian program a claim that Tehran has time in and time out rejected. "We are convinced that the path of sanctions is not optimal." "At the same time, the possibility that events may develop along these lines cannot be excluded." In a speech at the Arab Summit in Libya Russian President Dmitry Medvedev stated he does not support sanctions that will affect the Iranian civilian population stating that "sanctions must be carefully adjusted and not aimed at Iran's civilian population." 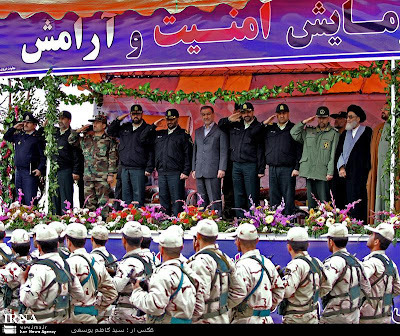 Iranian President Ahmadinejad speaking at a ceremony at Shahrekord in central Iran for the opening of a hydroelectric dam across the Iranian river Karun criticized the west for one sided support for Israel. There is not a brave statesman in the West. At least it seems so for the present. Maybe one will be found in the future." Ahmadinejad stated the west should be more neutral and objective and do so by pulling support from the Zionists stating Washington was a major part of the Middle East conflict for their long time support of Israel. "We want to describe the bravery of the airmen to the people who have not experienced the war." 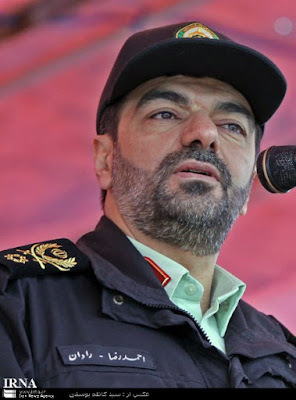 Commander of the Islamic Republic of Iran's Air Force (IRIAF), Pilot Brigadier General Hassan Shahsafi has credited Iran's military capability in light of the war with Iraq 20 years ago and the arms embargo that has been placed on Iran since the revolution of 1979. He put special emphasize on Operation Kaman 99 an (almost unheard of in the west) operation under taken by the Iranian Air Force less than 24 hours after the Iraqi invasion of September 22nd 1980, which saw 40 American made F-4 Phantom II's attack Baghdad in retaliation whilst Iranian air space was covered by 60 F-14 Tomcats that had been pushed into service with the newly formed Iranian Air Force and written off by the American media. Last year, President Obama’s message was aimed at the senior leadership of the Islamic Republic, showing the way ahead for normalization of relations between the two countries. This year’s message is a commentary on Islamic Republic’s refusal to regard Obama’s presidency as a new beginning in US-Iranian relationship. 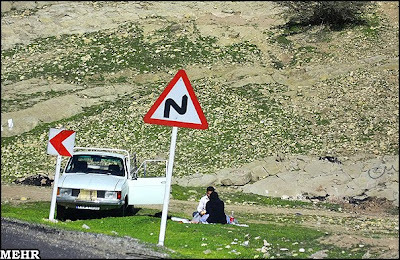 Iranian families on the road on the eve of the Persian New Year holidays: 20 March-4 April. Mehr Photos. Iran has jailed a former vice president and prominent reformist Hossein Marashi. Mr. Marashi, a vice president in Khatami’s administration from 1997 to 2005, was convicted for spreading propaganda against the Islamic Republic and is give a one-year sentence. He was a supporter of the Green movement. Mr. Marashi was taken to Tehran’s notorious Evin prison on Thursday. Jailing such prominent figure on the eve of the Persian New Year was a highly unusual move by the authorities, manifesting the growing rifts in the Islamic Republic. 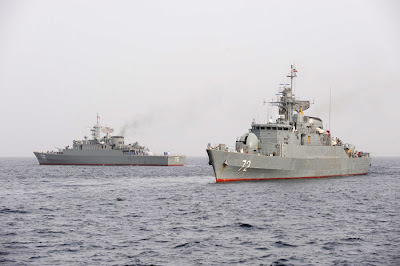 Somali pirates today abandoned the hijacked Iranian vessel SAAD 1. The ship was hijacked five months ago and had been anchored off Somalia’s Indian Ocean port of Garacad. On Sunday, the pirates set sail in the captured ship, but they encountered the Italian frigate Scirocco that was patrolling nearby. The pirates then abandoned SAAD 1 and returned to Garacad in a dinghy, said Shona Lowe, the NATO anti-piracy spokeswoman [AP, 18 March]. Iran’s nuclear chief Ali Akbar Salehi announced on Wednesday that Iran was ready to swap at once some 1,200 kg of its low enriched uranium (more than two-thirds of its known LEU) for 120 kg of 20 percent-enriched fuel for its research reactor, an idea previously rejected by Iran, which wanted the swap to take place in several phases. But Salehi added that the swap needed to take place on Iranian soil, an idea previously rejected by the West, which had proposed Russia, France or Turkey as the venues for the exchange. US Undersecretary of State William Burns, in Moscow for talks with Russian officials on Iran, said yesterday that the US feels a “sense of urgency” toward Iran’s nuclear program. “It’s time o demonstrate that there are consequences to [Iran’s] behavior.” [AFP, 17 March]. Russian Premier Vladimir Putin said today in Moscow that Bushehr, Iran’s first nuclear power plant, would go online in summer. The Russians are building the Bushehr plant and have many times in the past delayed its completion. Riyadh lately has begun to speak openly to US Secretary of State Hillary Clinton of the potential need for a military option against Iran. The German news magazine SPIEGEL claimed in an article yesterday that there exists a strong unity between Israel and Persian Gulf's Arab states against a militarily powerful Iran. 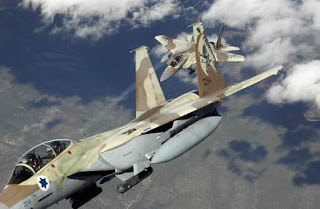 Recent reports even go on to suggest that Saudi Arabia would likely even open up their airspace for Israeli warplanes to cross to attack Iran! Similar reports had come out about a year ago around the same time the US stated they had no intent on letting Israeli warplanes crossing Iraqi airspace. 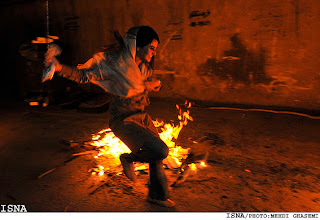 Tonight is the annual Persian Fire Festival, Charshanbeh Soori. The ancient ritual is held on the eve of the last Wednesday of the Persian calendar year. 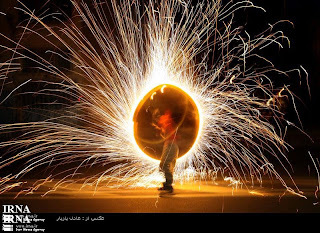 Iranians jump over bonfires and set off firecrackers to receive the "redness" of fire and to get rid of their "yellowness," strength as opposed to weakness. Iran’s Supreme Leader Ayatollah Khamenei on Sunday urged Iranians to shun tonight’s festival, saying it is un-Islamic and would cause harm in the society. But reports from Tehran and other major cities in Iran indicate that this year’s Charshanbeh Soori festivals were one of the largest in memory. 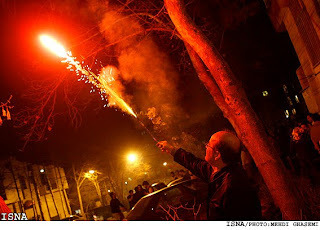 State-owned Fars New Agency is reporting that 224 people have been injured during the festivities. There are unconfirmed reports that the festivities in a number of cities have turned political, with some people chanting anti-government slogans. UPDATE: NAJA Deputy Commander Brig. 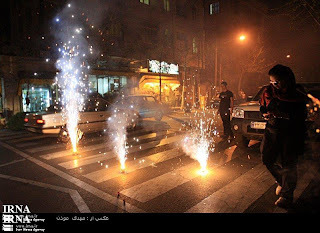 Gen. Radan said in Tehran that 50 people have been arrested for disturbing peace during the Charshanbeh Soori festivities [ISNA, 17 March]. "See what has become of Israel. They [the West] gathered the most criminal people in the world and stationed them in our region with lies and fabricated scenarios. They waged wars, committed massive aggression… and made millions of people homeless. Today, it is clear that Israel is the most hated regime in the world… It is not useful for its masters (the West) anymore. They are in doubt now. They wonder whether to continue spending money on this regime or not. But whether they want it or not, with god's grace, this regime will be annihilated and Palestinians and other regional nations will be rid of its bad omen." "They think in their underdeveloped minds that if they launch another war against Lebanon or Syria it might help them survive a little longer. I am telling them that you are in a situation now that more aggressions or wars will not save you." What are you doing in our region? Why are you deploying military forces here? If you think military deployment will help you seize the oil in Iraq and in the Persian Gulf, I must tell you that the young generation of the Middle East will cut your hands off from the oil reserves of the Persian Gulf." 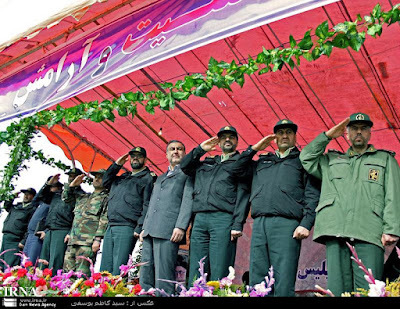 Maj. Gen. Ataollah Salehi, the commander of Iran’s Artesh, the country’s regular military, warned of “destruction” of any aggressor attacking Iran. Iran's state-owned Press TV linked Salehi’s remarks to Israeli threats of a military attack against the country's nuclear facilities. “Plans for a military attack against Iran have gained momentum in Tel Aviv over the past few months,” Press TV said on its website. “Israeli Deputy Foreign Minister Danny Ayalon [has] warned Iran that Tel Aviv's persistent threats of military action were not just a bluff,” [Press TV, 15 March]. Iraqi Prime Minister Nouri Al-Maliki and former premier and secular leader Ayad Allawi are leading their political blocs to big victories in the country’s parliamentary elections. Al-Maliki is carrying major Shia provinces of Basra, Najaf and Karbala and leads in Baghdad, with Allawi’s bloc carrying the Sunni provinces of Anbar, Diyala and Sallahudin and a surprising lead in Kirkuk. Pro-Iran Iraqi National Alliance (INA), led by Hakim’s Supreme Islamic Iraqi Council and cleric Moqtada Al-Sadr, lost all major Shia provinces to Al-Maliki, carrying only small provinces near Iranian border. The Kurdistaniya, the main Kurdish alliance, carried the Kurdish provinces as expected, but the alliance is finishing second in Kirkuk to Allawi’s bloc, a major blow to Kurdish claim over the oil-rich region. "This is not a rhetoric issue in a political war. This is a fact. The countries on the opposite side can do nothing without Iran. They do not want to see Iran's presence in international relations and equations. 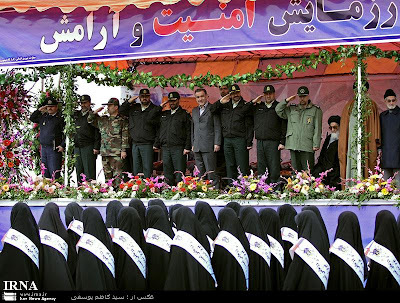 They have no option but to keep silent about consecutive victories of the Iranian nation." ...he was quoted as stating. The imagery - and the concomitant political message - was compelling. The image of a young man being surrounded by balaclava-clad security officers by the side of a small commercial plane was designed to send the strongest possible message to Western intelligence services, their political masters and the Western public in general. If the West led by the mighty United States has failed in its nearly nine-year pursuit of al-Qaeda leader Osama bin Laden and his deputy Ayman al-Zawahiri, embattled Iran managed to get its man with minimal political and economic cost. Aside from frustrating American subversion efforts in Iran's southeast, the capture of the Jundallah leader sends an unmistakable message that in the intelligence wars of the Middle East, the Islamic Republic of Iran has once again seized the initiative. The repercussions of this will be felt across all spheres and at all levels, boosting Iran's diplomatic and political posture in the region, and thus making the country less vulnerable to American and Israeli bullying. 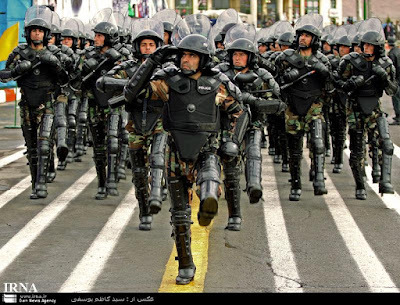 The Islamic Republic prides itself on having efficient and adaptive security and intelligence services. 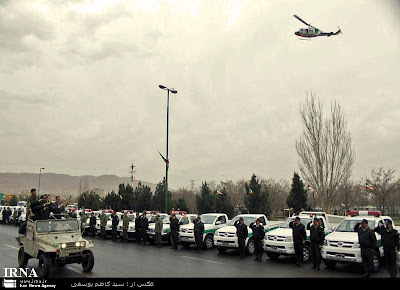 Iranian officials often cite the successful experience of these agencies in countering a broad range of security and intelligence threats, including terrorism by left-wing and secessionist groups and intense espionage and subversion activities by Western intelligence services, over the past 30 years to underscore their skills and capabilities. It seems that the full gamut of these capabilities was deployed against Jundallah and its local allies in Iran and Pakistan to great effect, to the extent that the group is now for all intents and purposes decapitated and probably a spent force. Iranian intelligence had been monitoring Abdulmalik Rigi round the clock since August 2009, but moving against him was difficult due to strong American backing and the fear of exposing invaluable methods and agents. 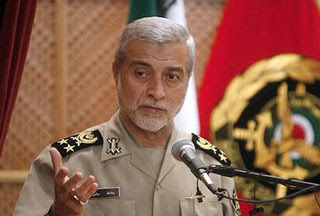 But the major suicide bombing on October 18, 2009, which targeted a conference hall in the Pishin area of Sistan and Balochistan where senior Iranian Revolutionary Guards Corps (IRGC) commanders were hosting a reconciliation meeting with local tribal elders, killing dozens of IRGC officers, including the deputy commander of the Guards' land forces, forced a decisive move against Rigi. Security sources in Tehran are keen to highlight Abdulmalik Rigi's jet-set lifestyle, describing constant travel between Dubai in the United Arab Emirates (UAE), Islamabad, Kabul and Central Asian capitals since early 2006. 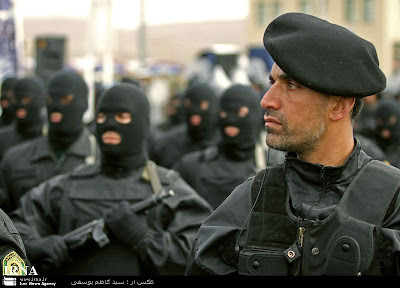 In any event, security sources in Tehran tell Asia Times Online that they have "massive" amounts of information and documents in their possession that link Jundallah to the CIA and specialized branches of the United States military operating in Pakistan and Afghanistan. They also claim that the CIA had prior knowledge of the suicide bombing in Pishin in October (which was a massive blow against the IRGC) but there is an ongoing debate within security circles in Tehran as to whether the Americans had actively instigated the terrorist attack. 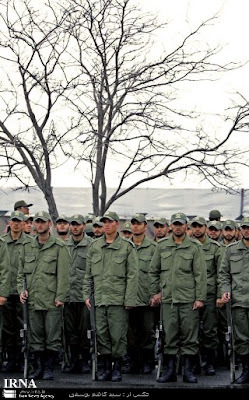 The outcome of this debate may well have serious repercussions, possibly prompting IRGC Qods force retaliation against American secret agents operating in Pakistan and Afghanistan. 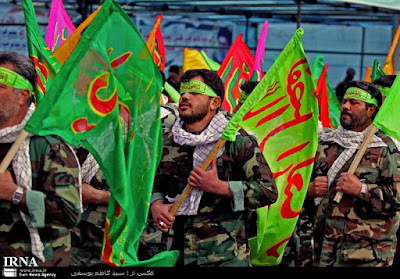 The IRGC Qods force is believed to have identified every noteworthy component of American intelligence activity in the region and the Qods force has the capability to strike a deadly blow against American intelligence assets in the region and beyond. By any standard, Abdulmalik Rigi's arrest is a major success for the Islamic Republic's intelligence services. This dramatic operation has boosted the morale of Islamic Republic loyalists throughout the Middle East and caused considerable dismay and embarrassment to Iran's Western enemies. 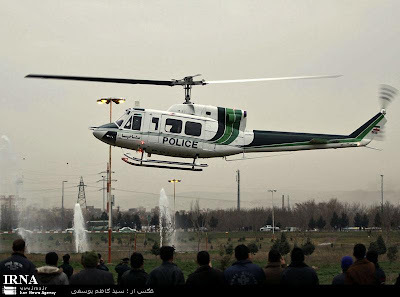 Rigi's arrest once again tip[s] the balance of confidence in favor of the Iranians, especially since, unlike Mabhouh's assassination [by Israel], the operation was carried out with flawless precision and efficiency and moreover it was neither immoral nor did it violate any international laws. Today, once again President Obama signed and renewed the Iran Sanctions Act for one additional year. Every time the topic of Iran sanctions is raised, we [in Iran] ask ourself a very pointed question: when was there a time we were not sanctioned? More than 11,000 days have elapsed since Iran’s revolution of Feb 11, 1979. 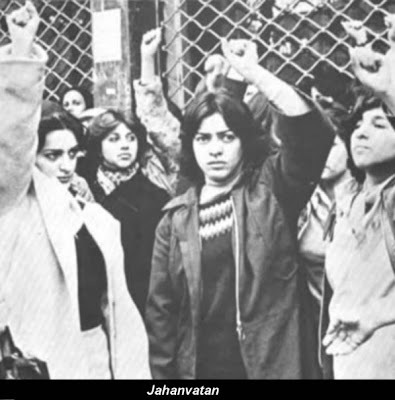 During this entire period, the only time Iran was not under US sanctions was just under a year's time: the time period between the Revolution’s Day on Feb. 11, 1979 and the occupation of the "spy nest" (US Embassy in Tehran), on Nov. 4 1979. Since then, sanctions on Iran have been continually expanded. In other words, the Iranian nation has been under sanctions by the US and its like-minded allies for 10,928 days. However, political realism or even simple reason tells us, if in 10,928 days this policy has continued to fail in its intended goal, the evidence suggests that for some reason the United States and its western allies cannot comprehend or accept this policy's failure. In other words, to put this more bluntly, if these sanctions caused some suffering to the Iranian people, at the same time they also did not produce the intended results for the architects and implementers of these said sanctions. - First: The "spy nest" occupation (US Embassy) period from 1979 to 1981. - Second: The Sacred Defense (Iran–Iraq War) period from 1981 to 1988. - Third: The reconstruction period from 1989 to 1992. - Fourth: The Clinton era of dual containment from 1993 to 2001. - Fifth: The aftermath period of September 11, 2001. - Sixth: US led UN Security Council resolutions since 2006. During these time periods, although sanctions were introduced and applied in different forms and shapes, they did not produce their intended goals of overthrowing the Iranian government and/or to give up its nuclear program. From World War II until now- especially in decades following the 1970’s- the success of sanctions has continually decreased, and nowhere is this more evident than in recent times. Between World War I until 1990, for nearly 75 years, a total of 115 economic sanctions have been put in place and executed against a multitude of countries. On average, that's roughly 1.5 sanctions per year. However, since 1990, the number of economic sanctions have increasingly dramatically. For example, between 1990 and 1999, 66 countries experienced economic sanctions. In other words, the average annual number of sanctions have increased nearly five times: from 1.5 sanctions per year for the period of 1918 to 1999, to 6.6 sanctions per year between 1990 and 1999, respectively. In fact, in the contemporary sense, one of the reasons for a reduction in the success of sanctions is due to this very increase in the total number of sanctions. When the range of sanctions becomes so extensive and covers so many countries, appropriate structures against sanctions emerge within both the formal and informal international economy. Many experts believe that with the downfall of the Soviet Union and the end of the cold war, the rise of a single polar world order led by the United States has provided the main cause for this incredible increase in sanction regimes. This is in part due to the fact that the U.S. government has always been a world leader in the placement of economic sanction policies. From 1918 to 1990, the US government is responsible for 77 out of a total of 115 sanction regimes in the world. That represents 67% of the total sanctions placed during this period. However, this share of imposing sanctions shoots to 92% for the period 1990 to 1999. In just the first term of the President Clinton administration, 61 U.S. government economic sanctions were implemented against 35 countries, representing a population of over 2.3 billion people; meaning nearly 42 percent of the entire world population were under some form of US sanctions at one time or another! Over the past 30 years, some of these sanctions implemented by the United States were against Iran. From Nov. 14 1979, which is 10 days after the occupation of the "spy nest" (US Embassy), Jimmy Carter’s presidential directive 12170 ordered the freezing of $12 billion of Iran's assets. A few months later, in April 1980, Carter ordered restrictions on trade and travel to Iran. In March 15, 1995, during the Clinton administration, the National Emergency Act of March 15, 1995 passed, which increased the range of these sanctions. In the last 30 years, this process has persisted, with 34 similar enactments or continuations. No doubt, during these past 30 years, the US government has done all it could do against Iran, and if it were possible to do more, they'd have done it by now. Now, besides extending the National Emergency act for one more year, they're also trying for a new round of sanctions at the UN Security Council. Considering all that's taken place over the past 30 years, this will be the “seventh period” of sanctions; perhaps with newer approaches, and more pressure imposed on Iran. However, if the sanctions of the past three decades (encompassing six previous general sanction periods) have not produced the intended results for the US and its allies, what makes them hope this time will? The Iranian parliament, Majlis, by a vote of 111-105, has rejected President Ahmadinejad’s request for a $40 billion allocation to help people who would be affected when the state subsidiaries end in the new Iranian fiscal year. The Majlis was fearful that the injection of so much cash into the economy would have disastrous inflationary consequences. 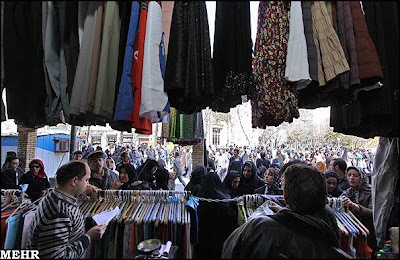 Ahmadinejad argued that the allocation was needed to soften the political and financial blow when the subsidiaries end. It was unclear if the no-subsidiary law could now be implemented without the cash allocation provisions. The government can still opt to cut its cash allocation request by half in order to gain the support of Majlis. Reversing Iran’s economic policy of using the oil revenues to subsidies consumer’s goods has long been regarded as a necessary step to modernize the country’s troubled economy. 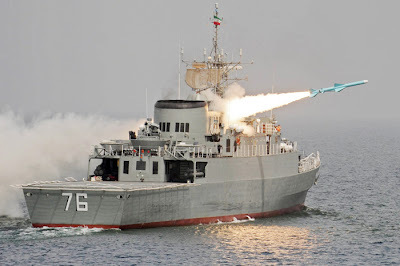 IRIS Jamaran successfully test fires Noor AShM. IRIS Jamaran (76) and IRIS Alborz (72). IRIS Alborz Captain (Nakhoda Yekom) and Lieutenant (Nav Sarvan). Note skipper's American style cap and vessel designation, as well as the fraternal nature of the crew. Presidents Karzai and Ahmadinejad meet in Kabul. President Ahmadinejad's classic Boeing 707-386C aircraft in the background, on its return to Mehrabad International Airport (THR OIII). At the start of the film, the aircraft appears to be a Boeing 737-300 series, matching the initial description in the Russian press from Bishkek. 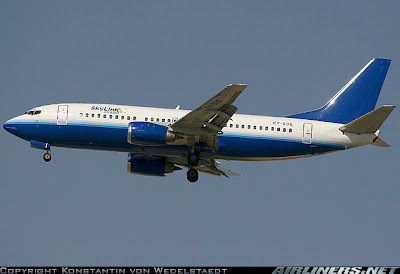 This plane actually appears to be an Eastok Avia Boeing 737-301 (see photo below), which matches the flight details of Kyrgyzstan Airlines QH 454, operated by Eastok Avia, enroute from Dubai (DXB / OMDB) to Bishkek-Manas, Kyrgyzstan (FRU / UAFM). There is a very brief clip of a blindfolded man removed from the aircraft, amid footage devoted to the passengers being inconvenienced and re-boarded using an Iran Air ramp stair. Rigi is seen in what appears to be a cargo hold of a small plane, wearing a different blindfold then the one later seen while he is in the passenger compartment of the IRIAF Dassault Falcon (Mystere) 20E. Perhaps this film footage is related to that referred to by PressTV last week, as the Islamic Republic of Iran was pressing Kyrgyzstan diplomatic officials on its apparent flip-flopping of accounting for what transpired on its aircraft. 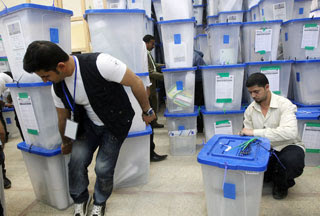 Iraq's Independent High Electoral Commission said today that 62.4 percent of nearly 20 million eligible voters cast their ballot in the Sunday parliamentary elections. The high turnout surpassed even the most optimistic forecasts before the polls opened, and it is seen as a major victory over Al Qaeda who attempted to disrupt the elections by suicide bombings and rocket attacks in different parts of the country. Vice President Joe Biden today began a visit to Israel and the west Bank. Biden assured Israelis that Washington would close ranks against threat from a nuclear Iran. "I can promise the Israeli people that we will confront, as allies, any security challenge it will face. A nuclear-armed Iran would constitute a threat not only to Israel -- it would also constitute a threat to the United States," Biden said in an interview with Israel’s largest circulation newspaper Yedioth Ahronoth. Biden will meet Palestinian leaders in the West Bank on Wednesday. 8 March, the International Women’s Day: Our congratulations to all the women in the world. Our best wishes to Iranian women fighting for the cause of equal rights between men and women and freedom in Iran. 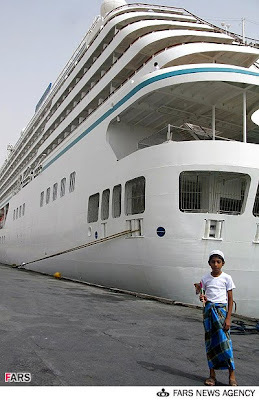 Luxury cruise ship Crystal Serenity arrives in Bandar Abbas, Iran. ISLAMABAD: The recovery of a Pakistani Computerised National Identity Card from the possession of Abdolmalek Rigi, an Iranian terrorist and head of Jundallah group, has put a question mark on the Nadra’s “self-proclaimed secure” registration system. The card was recovered by Iranian security personnel when Rigi was arrested while travelling on a flight heading to an Arab country via Pakistan on Feb 23. The interior ministry claimed that it was a fake card, and not issued by the National Database Registration Authority. Iranian authorities are reported to have informed Pakistan about the recovery of the CNIC carrying photograph of Abdolmalek Rigi and sought an investigation into the matter, but the government did not make it public. However, the interior ministry had to issue its point of view only when a TV channel telecast the news about Rigi’s identity card. The recovery of CNIC from the terrorist leader has thrown a challenge to security of Nadra’s database and its official slogan “deception no more”. At the time of arrest Rigi was allegedly carrying a CNIC bearing number 42201-5884556-1 issued in the name of Saeed Ahmed, son of Ghulam Haider. The card shows his year of birth as 1978. Rigi’s card was found to be original when checked through a general procedure of Nadra by simply sending an SMS message to a number, 7000. A senior Nadra official told Dawn that the card was issued in 2004 while the authority had acquired the facility of biometrics and facial scanning in 2005. The facility enables Nadra to record finger and thumb impressions as well as facial features. He said Rigi’s card was fake because it showed a thumb impression on the card despite the fact the biometrics system in Nadra started working in 2005. No thumb impressions of applicants were taken before introduction of the system, he added. 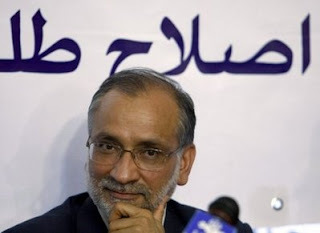 He said Nadra’s system was so secure that it foiled over 250 attempts of getting fake CNIC in a day. It had so far prevented from issuing over 85,000 fake cards, he added. However, the official did not rule out the possibility that CNICs would have been issued to some Afghan nationals who were born in Pakistan and managed to get the cards on the basis of manual ID cards issued to their parents over two or three decades ago. “But these manual ID cards cannot be used for any transaction and traced whenever they are used,” he added. TEHRAN (FNA)- Pakistan's National Database and Registration Authority (NADRA) announced that the Pakistani ID-card of the ringleader of the Jundollah terrorist group, Abdolmalek Rigi, is fake, dismissing earlier media reports that Rigi was a Pakistani citizen. Sources said that the Iranian Foreign Ministry had sent a letter of protest to Islamabad after a NADRA-issued card was retrieved from Rigi during his capture in Iran late February. The Iranian Foreign Ministry protested at Islamabad for issuing a Pakistani ID-card for Rigi, saying it showed the country's cooperation with the terrorist gang. While NADRA said Rigi has forged the mentioned document, Pakistan's state-run TV underlined the ID-card was original and issued by the Pakistani department. A press release by Pakistan's interior ministry said Rigi's brother, Abdolhamid, an Iranian also has a fake Pakistani identity card. Iranian authorities had earlier presented evidence to Islamabad that showed links between Pakistani intelligence services and the Jundollah terrorist group and called on Pakistani officials to capture and extradite Rigi to Tehran based on a mutual security agreement signed between the two neighboring countries. The documents were based on the confessions made by Abdolhamid who is currently in prison in Iran. 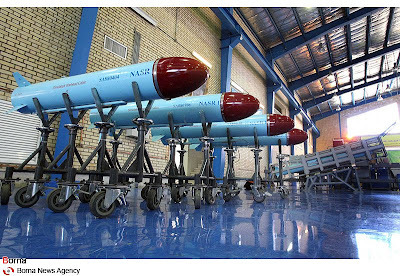 The Iranian Defense Ministry started mass-production of Nasr 1 (Victory 1) cruise missiles on Sunday. 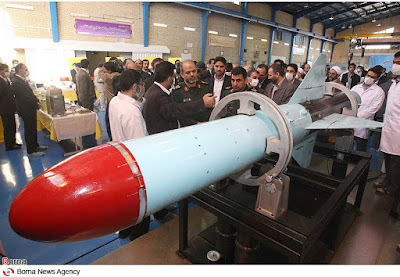 "Nasr 1 missile is a cruise missile capable of destroying 3-ton weighted vessels," Iranian Interior Minister Brigadier General Ahmad Vahidi said at a ceremony to inaugurate Nasr 1 production line at the defense ministry's Aerospace Industries Organization. 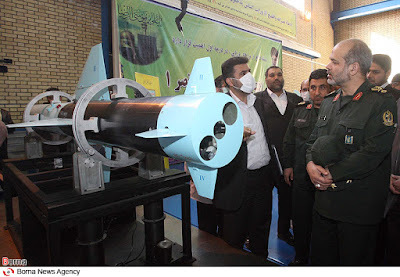 The minister stressed that once the Army's Navy and the Islamic Revolution Guards Corps (IRGC) naval forces come in possession of these mass-produced cruise missiles, the Islamic Republic of Iran's naval defense capability would experience an outstanding jump forward. Iranian President Mahmoud Ahmadinejad will arrive in Kabul on Monday. 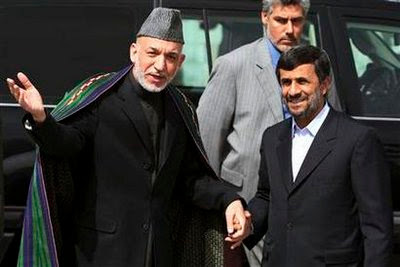 Talks with Afghan President Hamid Karzai would top the agenda of Ahmadinejad’s one-day visit to Afghanistan. Iraqis are going to the polls today in large numbers in one of the most crucial elections since Saddam’s fall. Some 6,200 candidates are competing for 325 seats in the new parliament, which would pick the new premier to lead Iraqi government for the next four years. Iraqi National Alliance (INA): A broad religious Shiite coalition led by the Iranian-backed Supreme Islamic Iraqi Council (SIIC), the radical cleric Muqtada al-Sadr and the Fadhila party. 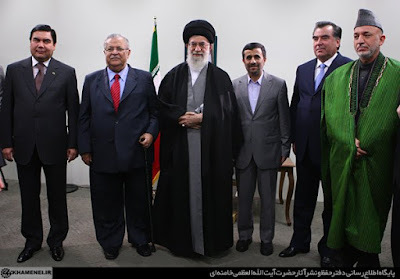 Of the main Shiite-led alliances, the INA is the most closely aligned with Iran. State of Law Coalition: Prime Minister Nouri al-Maliki's Dawa Party is the backbone of a moderate coalition that includes smaller, independent groups of Shiites and Sunnis. Al-Maliki will be hard pressed to emulate his success in the provincial elections now that his Shiite rivals have joined forces against him. Iraqiya: Led by former Prime Minister Ayad Allawi, a Shiite, and prominent Sunni politician, Saleh al-Mutlaq. The coalition, billed as secular, is backed by Shiites and Sunnis as well as former members of Saddam's regime. Iraq Unity Alliance: Led by Interior Minister Jawad al-Bolani, a Shiite who enjoys popularity among the police force he oversees, and Ahmed Abu Risha, leader of the Anbar province Awakening Council - a Sunni tribal militia that joined the US- led fight against insurgents in 2006. The coalition is a newcomer in Iraqi politics. Iraqi Accordance: A moderate coalition that is the main Sunni bloc in parliament. It is dominated by the Iraqi Islamic Party - the largest Sunni political party in Iraq. Kurdish Alliance: Made up of four Kurdish parties, the bloc is dominated by two powerful political groups - the KDP and PUK. The Kurdish is one of the more powerful in the current parliament because of the number of seats it holds and its unified voting bloc. A newcomer to the political scene in Kurdistan, called "Gorran," or "Change," has been lately challenging the two parties' dominance in Kurdish politics. Iranian President Mahmoud Ahmadinejad today called the September 11 attacks on the Twin Towers in New York a “big lie” (“Dorough-e Bozorgh”). Speaking to the senior leadership of Iran’s Intelligence Ministry in Tehran, Ahmadinejad added that the US fabricated the event to justify its invasion of Afghanistan. 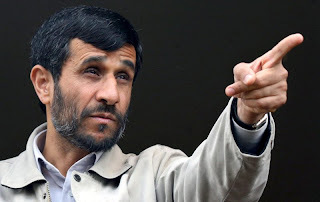 “The September 11 was a big lie and served as an excuse for the war against terrorism and a pretext for the invasion of Afghanistan,” Ahmadinejad said [IRNA, 6 March]. Nearly 3,000 people died when Al Qaeda operatives hijacked airliners and attacked New York’s Twin Towers and the Pentagon. 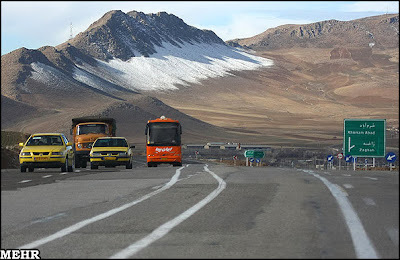 Jane’s Defence Weekly, 4 March 2010, reported that Iran unveiled the Simorgh space-launch vehicle (SLV) on 3 February, but as of March 2010 has not publicly revealed the location of the rocket’s launch complex. 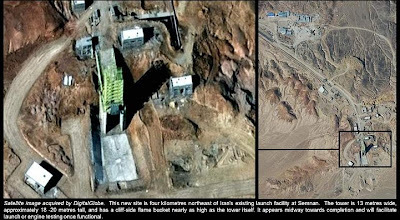 However, IHS Jane’s has observed a new site four kilometres northeast of Iran’s existing launch facility at Semnan on a WorldView-2 satellite image dated 6 February 2010. It contains a gantry tower, which is 13 metres wide, approximately18 – 20 metres tall and has a cliff-side flame bucket nearly as high as the tower itself. It appears midway towards completion. Although the tower is not yet tall enough to facilitate vertical assembly of the 27-metre Simorgh, the launch pad could easily accommodate Iran’s new rocket if the gantry were to be extended by an additional 10 metres. In addition to this site, IHS Jane’s has observed another facility two and a half kilometers to the southwest; between the new site and the existing one. Although this facility is in early stages of construction, its heavily secured nature and restricted access indicate it is a primary element of the newly constructed complex. Using satellite imagery from the Ikonos and WorldView-2 satellites taken on 11 February 2010, IHS Jane’s has identified the Simorgh and Safir-2 rockets displayed during the pro-revolution rallies in Tehran’s Azadi Square. The commercial satellite imagery is coded with geographic metadata that enables IHS Jane’s to garner several accurate measurements of the Simorgh. 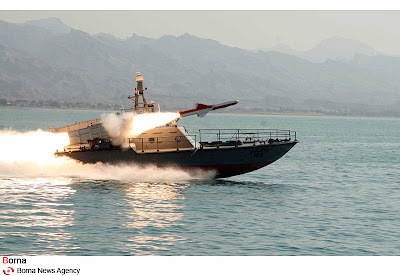 The development of the Semnan facility and the Simorgh SLV both demonstrate the likelihood of collaboration with North Korea in Iran’s missile programme. The platforms seen on the new gantry tower resemble those seen on the gantry tower at North Korea’s new launch pad at Tongchang. A drainage pit 170 metres directly in front of the pad also mirrors one at Pyongyang’s new west-coast launch site. 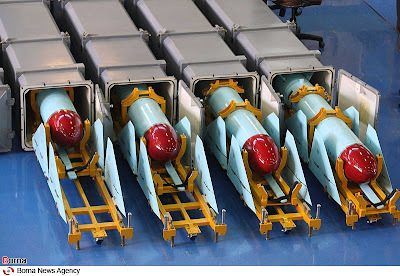 Similarly, the first stage of the Simorgh strongly resembles the North Korean Unha-2, with four clustered engines and nearly the same dimensions. That there will be a cost to pay for maintaining a legalist position toward its nuclear program, the Islamic Republic of Iran's leadership understand full well. From previous experiences with the West where the West has failed to deliver and continually moved the nuclear goalposts, they realize that it is nuclear rights and, to an extent, their very sovereignty that is at issue here. When one frames the issue in real Iranian terms, the Iranian position is well understood and predictable. Dennis Ross himself has written on taking advantage of this, and on purposely advancing an offer of false engagement that is intended to be rejected, in order to boost an anti-Iran agenda that deprives Iran of its nuclear rights, and moves forward elements of economic warfare to be directed against the Islamic Republic. This is a matter of public record, which everyone has read including the Iranians. A considerable amount of effort is being undertaken by the US State Department, to further isolate Iran and advance this anti-Iran agenda. One wonders how a sincere effort of US engagement by President Obama toward Iran would fare if a similar level of effort were undertaken beyond that of an abrupt take-it-or-leave-it offer, comparable to the exertion of the USG's current anti-Iran efforts. That the USG will ultimately succeed toward this latest anti-Iran effort is to be expected. But success this time around is also costing America, in terms of its leadership role on these related issues. The 118 member Non-Aligned Movement is behind the Islamic Republic of Iran's right to nuclear power, and the double standard policies exhibited by US policy is not being lost on rising regional powers, such as Turkey, China and Brazil. While these takeaways may appear minor for the US compared to the level of economic sacrifice the Iranians are willing to accept in order to retain their nuclear rights and sovereignty, nevertheless this has a cumulative and enduring effect on US world standing. 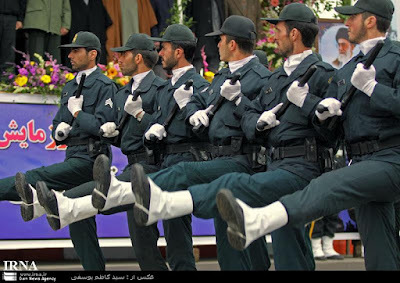 The Islamic Republic of Iran remains a revolutionary nation. Issues of rights and sovereignty shared by nations of the developing world make up elements of this revolutionary personality, and a shared cause such as the nuclear rights of developing nations allows revolutionary Iran to once again exhibit moral courage on the world stage, in the face of obvious double standard and hypocrisy. For the leadership of the Islamic Republic of Iran, this is of considerable importance, in addition to the very real advantages of developing an indigenous nuclear industry. Toward this endeavor, they appear to have the majority support of the Iranian people. In the midst of a diplomatic flurry among members of the UN Security Council to find a consensus in dealing with Iran’s nuclear program, two probable outcomes are emerging: UNSC will pass a watered-down sanction resolutions against Iran and Iran will continue with its nuclear program; the Round Four of an on-going match between the West and Iran being played at UNSC. But the implications for each side of the fourth round of sanctions are not equal. The West does not have much to lose. A nuclear Iran can co-exist with the West and its neighbors in the current state of international affairs. It’s a different story for Iran. The country’s economic and financial ties to the global markets are the price Iran would pay for its nuclear policy. Restrictions against Iranian banking activities abroad will be increased and for the first time the UNSC is expected to call for global “vigilance” against Iran’s Central Bank. The latter will be hurtful for Iran. Although a step short of blacklisting the country’s central bank to appease China, the resolution would create major hurdle for Iran to operate in major global markets dominated by the West. The cost of having a robust nuclear program will considerably jump for Iran. Countries much like individuals need to continually make difficult choices. Iran could have accepted the enriched uranium swap taking place in Turkey and by doing so it could stop the tightening of sanctions against its financial institutions. The end result would not have been much different for Iran. Its uranium enrichment program in Natanz would have remained intact and it could still opt to follow the Japanese option of being ready to make the bomb when it wanted to. But the Iranian government is once again overplaying its hand. It wants to use its nuclear program not just for its intended purpose, but also as a tool internally to further strengthen its position over its competitors, both inside and outside the Green movement, and adds to its prestige as perceived in the region. It could have swapped the uranium abroad, however, without jeopardizing those goals. And in the midst of all this, the economic and financial implications of such policy are pushed aside. The current Iranian government does not believe “it’s the economy, stupid” but that the economy is the domain of the stupid. March 21st is the start of Norouz, the Iranian New Year 1389. 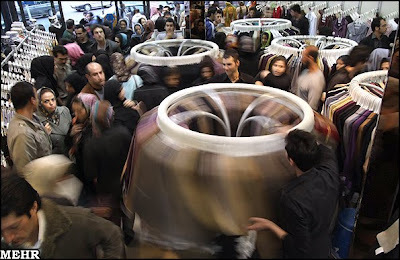 Mehr photos show shoppers in Tehran preparing to celebrate the new season wearing new clothes. Hamid Masouminejad, the Rome correspondent for Iran’s state-owned national TV network was confirmed to be one of the two Iranians arrested in Italy on arms trafficking charges. IRIB foreign news director Hassan Abedini said the network would hire a lawyer to defend Mr. Masouminejad. Italian police said Wednesday that five Italians and two Iranians were detained in the case. 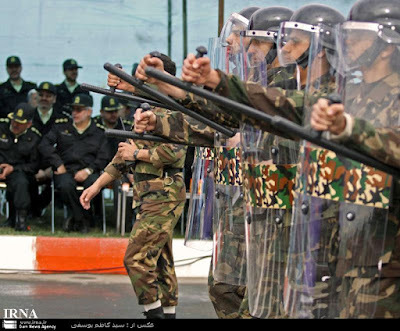 They are accused to ship weapons to Iran through third countries despite a UN embargo on such shipments. The reports in Iranian media indicate major failure by the US to convince the key members of the UN Security Council (UNSC) to support any new sanctions against Iran over its nuclear program. Kayhan reports that Russia is opposing any sanctions that directly or indirectly affect Iran’s ordinary people. The influential conservative newspaper also reports China’s opposition to any types of new sanctions against Iran [Kayhan, 4 March]. The media also is reporting the opposition to sanctions by key non-permanent members of the UNSC. Press TV reports that Turkish foreign minister, whose country is one of the current members of UNSC, opposes any new sanctions, saying imposing sanctions on Iran will have “catastrophic consequences” for the Middle East [Press TV, 4 March]. Fars New Agency reports that US Secretary of State Hillary Clinton has failed to convince the Brazilian president to support any sanctions against Iran [Fars, 4 March] Clinton just ended a visit to Brazil, which also holds a seat in the current session of the council. To pass a new sanctions resolution at UNSC, the West needs to get at least nine votes in the 15-member chamber, with Russia and China not casting any veto. There are 10 non-permanent members at the council. Currently they include Brazil and Turkey as well as Austria, Japan, Mexico, Nigeria, Uganda, Gabon, Bosnia and Lebanon. 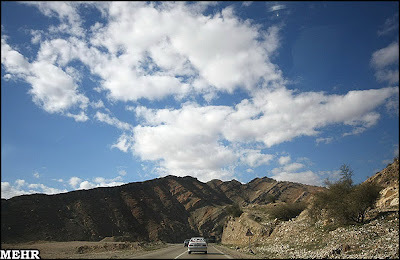 Uskowi on Iran’s first post appeared on 3 March 2007. Three years and hundreds of thousands of visitors later, we love to stay around three more years and beyond! On 19 April 2008, Mark Pyruz began posting on UOI and immediately lifted the blog’s quality and readership. 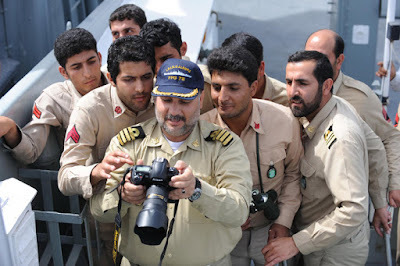 Today, Mark’s posts and photo and video galleries on Iran’s military and security forces have become an authoritative source for the students of Iranian armed forces and visited by hundreds of people each day. Paul Iddon began his posts on UOI on 31 July 2009 alongside running his busy blog, pauliddon.net. Paul as a student of history has enriched this blog with his historical perspectives on many current issues in Iran. We all have our day jobs and post during our spare time, not an easy task. Mark, Paul and I could not have continued our work at UOI without the encouragement and support of our readers throughout these years. To our readers: Thank you. We are looking forward to your active engagement, comments and criticism to make this blog more useful. And big thanks to all our fellow bloggers who have shown their support by providing links to our blog. Cheers to all! 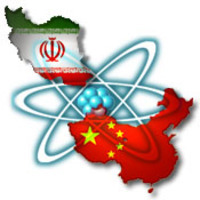 In light of Russia and the west planning new sanctions on Iran with regard to it's nuclear program, China has come forward demanding that diplomacy with Iran be given more time. China's latest statement came as a senior US diplomat, James Steinberg, arrived in Beijing on the highest level visit since relations when American and Chinese relations briefly tensed up two weeks ago. Iran rejected a UN International Atomic Energy Agency claim it was not co-operating with its investigation. World powers say Iran is enriching uranium to make nuclear weapons, but the Tehran government continually denounces this claim stating their program is for civilian purposes. The Iranian authorities have freed on bail a number of political prisoners in the past two days. Among the detainees released were Mohammad Maleki, the first president of the University of Tehran after the revolution. Maleki, 75, was the oldest person detained during the post-election massive wave of arrest of journalists, academics, human rights activists and political figures and supporters of the Green movement. Also released from the Evin prison on Monday, were Foad Sadeghi, the renowned journalist, as well as Mohammad Reza Maghsieh, Mahsa Jazini and Mehdi Motamedi Mehr. On Sunday, a group of other prominent journalists, including Mashallah Shamszaezin, Abdol Reza Tajik, Mohammad Jafar Mozaffar, Behrang Tonekaboni and Ali Hekmat, were released after posting heavy bonds. On Monday, however, the authorities closed down the influential reformist newspaper, Etemad. Later that day, a renowned film director, Jafar Panahi, was arrested. Iran’s renowned film director Jafar Panahi was arrested last night in Tehran. Panahi’s films, “Circle”, “Crimson Gold” and “Offside”, have won many awards at international festivals. Panahi is a supporter of Iran’s Green movement. “About 10 on Monday evening, several plainclothes agents broke into the house,” Panah Panahi, the director’s son, told Rahesabz website. Panahi, his wife and daughter as well as 15 guests were arrested and taken to an unknown location, Panah said, adding that the agents had searched the house and confiscated personal belongings and computers. The Kyrgyz foreign ministry today denied that any foreign nationals had been removed from the flight between Dubai and Bishkek once it had been grounded in Iran. "Information... published in some media about the detention of foreign nationals on board the Kyrgyzstan Airlines aircraft does not correspond with reality," the foreign ministry statement said [AFP, 1 March]. The strange denial by Kyrgyzstan adds to the mystery surrounding Rigi’s arrest. Iran’s interior minister had already contradicted the official version by saying that Rigi was arrested in a foreign country and then brought back to Iran. The Pakistani ambassador in Tehran has also claimed that Rigi’s arrest could not have happened without his country’s direct involvement. Some Iran watchers now believe that Rigi was arrested by Pakistani ISI and transported to Iran aboard a Pakistani falcon corporate jet. The forced landing of the Kyrgyz jet in Bandar Abbas could then be a diversion tactic to mask the arrest by ISI. In a related development, the Kyrgyz government launched a protest with Iran for forcing one of its passenger planes to land in its territory. "Kyrgyz ambassador Medetkan Sherimkulov met with the deputy foreign minister of the Islamic Republic of Iran and protested on the inadmissibility of such actions from the Iranian side," the Kyrgyz foreign ministry statement said.